Brian Palizano still puts his boots on one foot at a time- his Army boots that is. A former foster child at Little Flower Children and Family Services of New York, Brian was determined not to let his childhood hardships hold him back from accomplishing his goals. 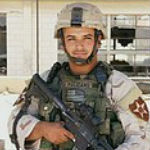 He has excelled in the United States Army, completing two tours in Iraq and currently supervising soldiers at Fort Benning, Georgia. His life’s path may have been full of roadblocks, but it only strengthened his resolve to fight for a better future. Brian was placed in foster care at the age of four after the city deemed his mother unfit to care for him. Being so young made it difficult for Brian to adjust to his new environment. However, he says the Little Flower staff was extremely accommodating and caring. Ultimately, he realized he was in safe hands. Throughout his time at Little Flower, Brian was placed in several foster homes. He says his nerves were on edge every time he stepped into a new house. Even at such a young age he recognized that the families were taking a chance on him and that they deserved his trust and cooperation. As the years passed and his 18th birthday approached, Brian considered where his life would take him. September 11th, 2001 made that decision obvious to him. Brian recalls sitting on a bus when he heard that America was under attack. Soon after, Brian’s family members told him a neighbor of theirs in Bushwick, Brooklyn had lost his two-year-old daughter in one of the towers. With that news in mind, Brian headed to the local Army recruiting station and bravely asked when he could leave. It was an easy decision, he says, because it offered him the opportunity to step up and make good in his life. By the end of the week, Brian was in basic training. Getting adjusted to the military took some time. Brian credits being in foster care with teaching him how to interact in group settings with many different people. In the army, Brian was a part of a team that included soldiers of different races, religions, and ethnicities. Yet, to him they became a second family. And after two tours in Iraq, having people who he knew were looking out for him provided the sort of comfort he had not known since his time at Little Flower. Brian says that serving in the military taught him valuable traits that he will stay with him. Among them are loyalty, duty, respect, honor and personal courage to face fear, danger, and adversity in the name of what is right. Yet, the quality that tops his list is integrity. He believes each of use has an inner voice, which he describes as our “moral compass.” It is this voice, he says, that keeps us doing what is ethical, even when no one is watching. Brian currently has three years left in the Army. After returning from his second tour in Iraq, he was stationed at Fort Lewis in Washington where he was a squad leader in charge of eight soldiers. He is currently at Fort Benning in Georgia and trains new officers how to use the Stryker vehicle, the Army’s first new armored vehicle since the 1980s. Brian believes that joining the military has kept him on the right path. He knows that other young men in foster care often feel that everyone is against them and understands how easy it becomes to give up hope. Yet, his inspiring story can teach others that if they work hard and take advantage of available opportunities, they can reach their goals. Brian appreciates all the military has done for him, but he is excited to begin the next chapter of his life with his wife, Kristal, and their 18-month-old daughter, Kaelyn, who currently live on base with him in Georgia. Brian plans to return to college to obtain a degree in psychology. He also wants to continue serving his country and has started the process to become a police officer. Returning to New York and joining the NYPD would be a fitting career. After all, those here already know he’s one of the City’s finest.